First of all, I want to apologize to all of those whose comments have gone unanswered (and even unposted) for so long – they were lost in a little bit of blog-limbo which I only discovered today. On the plus side, I was pleased to find so many nice comments about my work (I love the comments) so please expect replies soon. Something exciting came in the mail today, though! Yaaaay! Not only is it my first yarn order from KnitPicks, but it’s a serious foray into the world of sock knitting. This yarn is going to end up as one pair of colorwork socks, but before that I’m going to get in a little practice on something more basic. 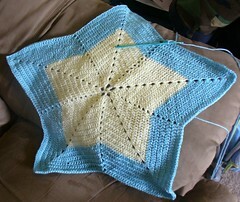 This little blanket is intended for the New Baby, using the Beth’s Little Star afghan pattern. Normally I’m not a big fan of wide swaths of double-crochet, but it really works here. I wanted something almost (but not quite) mindless to do, to just crochet and not have to think too hard. I’m going to make the rest of the blanket in the blue, so the central star is surrounded by sky, and then I’m going to make a few smaller stars in the yellow and sew them on. I think it’ll be really cute! I’m making it using an F hook and Red Heart Soft Baby – incidentally, the yarn that I have left over from Max’s crib afghan. Well…that’s all for now, but I’ll post again soon! I love your star afghan. Those colors are perfect. I have been wanting to order from knitpicks and you are really tempting me by showing this picture of yarn. 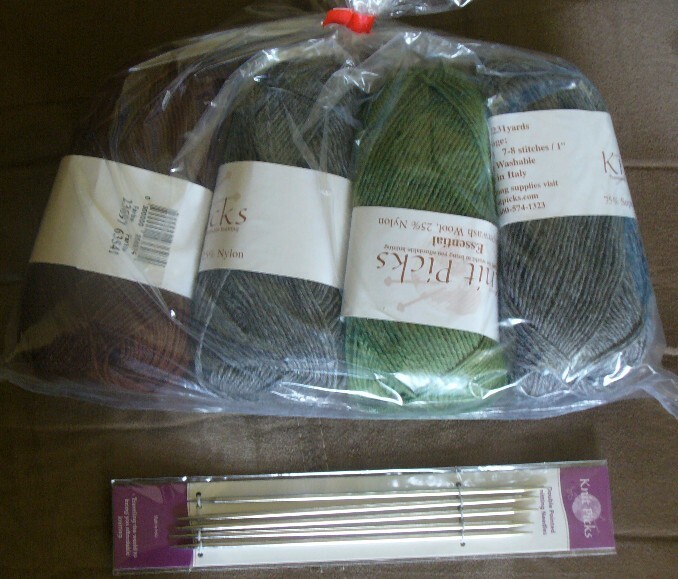 Your first order from Knitpicks? Oh, you’ll be back. I love Knitpicks. And socks. And your baby star afghan!